Who but Edgar could take the lovely feline found in so many cozy homes and turn it into a thing of horror? The narrator of this story relates how he and his wife had several pets (birds, gold-fish, a fine dog, rabbits, a small monkey) but the most beautiful and sagacious was a cat. This cat, named Pluto, was our narrator’s favorite pet and play-mate. Yet through great intemperance, he seizes it one night and cuts its eye out of the socket. As you can well imagine, the cat avoids him after this, but is unable to avoid its ultimate demise at the hands of its owner who hangs the cat in a nearby garden. In the middle of the night he and his wife are awakened by a terrible fire. Their home is burned completely, yet the neighbors are entranced by the one remaining wall, the one on which the bedstead rested, which bears the image of a cat upon its freshly laid plaster. 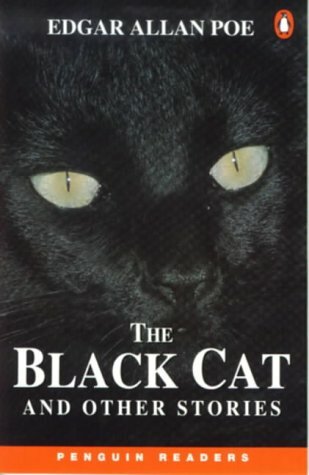 Although the narrator procures a second cat of black, with a white patch ever more resembling the gallows in his mind, there is no rest from the evil which now seems to be taking over. Even the wife is not spared her husband’s guilty wrath, or the influence of a creature out for revenge, whichever way the reader intends to interpret the story. How easy it would be to place the blame of one’s evil actions on an innocent creature, when they can only be placed squarely on our own imperfect nature. Still, when the leaves turn their edges into golden crispness, and the dusk falls sooner than it did a few weeks ago, it is somehow pleasant to think of black cats…to wonder that if they are wronged, they will somehow cause the truth to prevail. I love that picture. Is it from the cover of your edition? My edition is a nook anthology, and I thought I’d given credit for the picture I found online. Sadly, it doesn’t appear to be correctly linked. If I can’t find the source again, off it will come…so I am also adding the cover of a Penguin book. It’s such a good story. This story sounds perfect for this time of year, although the extreme cruelty toward the cat would bother me a great deal. Cruelty toward any creature is very difficult, I know what you mean. But, in the “Halloween-ish” story, the cat gets full revenge. It’s quite interesting psychologically. Have you ever read Natsuo Kirino? I keep running into her name and wondered if her novels are any good. This is an absolutely perfect story for the RIP challenge. So creepy, and actually reminded me in some places of The Tell Tale Heart. I have such respect for Great Books discussions! I have been certified by the University if Chicago to teach Jr. Great Books, which is a remarkable way to study literature for the children, but I always long to attend an adult group for myself. I bet they would have a lot to say about this particular story! As for coincidences, isn’t that wonderful?! his stories are wonderfull creepy their is a great app called ipoe that has taken some of them and added great graphics to the story . Thanks for telling me about “iPoe”, Stu! You always have so many helpful reading hints. I was amazed when I looked for images of this story how many times it had been made into a film , or a play, or how many arists have rendered their own version of the most salient points. It is a very intriguing story. Apparently it’s been too long since I visited your blog because I didn’t realize you moved to WP! I read this one many years ago and it was absolutely creepy. Although which of his short stories isn’t?! Well, Trish, you were a big part of the reason I switched (back) to WordPress. The frustration with Blogger became too much: no personal support, too many anonymous comments, etc. This is a great example of Poe at his creepiest. I wonder how people can be that scared of Stephen King, when to me, Poe is even scarier. Three cheers for the cat! I haven’t read this Poe story. I must look it up sometime. I have a black cat. I guess I should be extra careful never to cross him! I have a tabby which is almost black…I love her so much, I could never see any evil in her. Nor could I ever imagine anyone causing her harm. I’ll bet your black cat is beautiful! One of the scariest stories I have read. 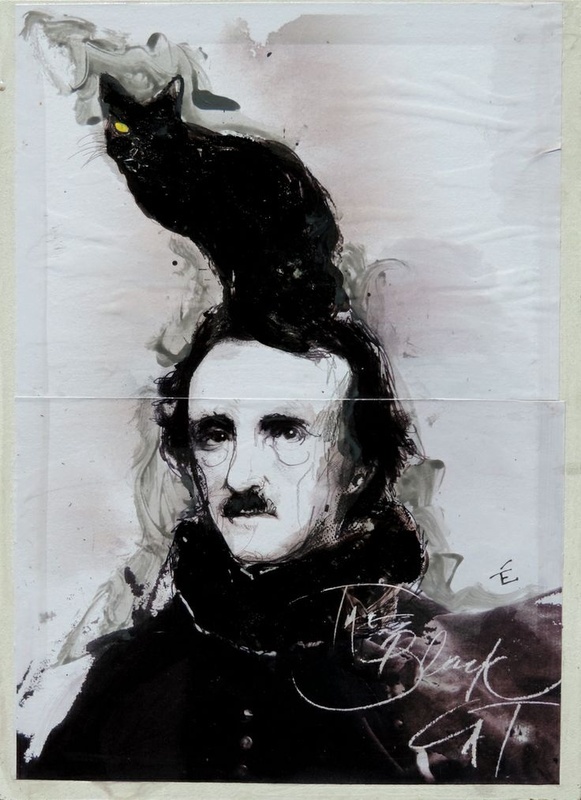 Really, Poe is one of the scariest authors I have read. Stephen King pales in comparison, in my opinion. Did this one remind you of the Tell-Tale Heart, too?